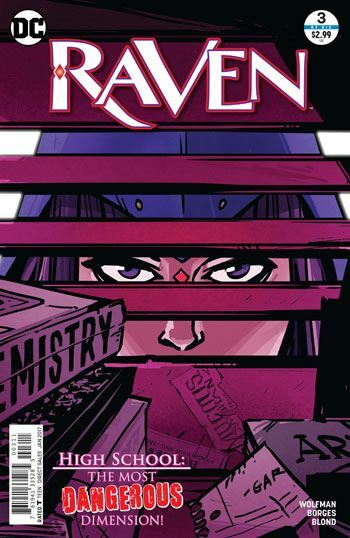 If I am going to praise anything about Raven #3 it will be the art. Every page is dynamic and interesting, and the colouring gives a creepy and sombre mood to the entire issue. The pages of the “carnival of souls” are particularly well rendered, and made me wish we had seen more of it. But sadly, that’s the best stuff I can say about this one. It’s not awful, don’t get me wrong. Raven details the terrible effects that losing her control can have (to wit – bringing forth her demonic and destructive father, Trigon). A lot of the dialogue feels natural, and occasionally witty. Perhaps part of the problem is that it is far from clear, even to Raven, exactly what is going on, or who is behind it. We do get introduced to a group of villains in the course of the story, but it seems fairly obvious that they are not the real players in the game, just taking advantage of the situation. So that makes this issue really hard to judge. And in those terms, I have to deem it unsuccessful. I don’t know who is causing all this torment for Raven and her teenage friends, and I’m not sure that I care. And, to he honest, the Christian element in the book is something I find completely off-putting, particularly considering the huge voting support that white Christians gave Trump. When the family Raven is staying with push their religion on her I keep wishing Trigon would emerge and eat them all. I suppose the Christian stuff is there as a counterbalance to Raven’s quasi-satanic nature. But Trigon is not meant to be Lucifer, and Raven is the daughter of a demon, not of the devil. For me, at least, it just adds to the factors in this book that are pushing me away from it.